Read reviews about this conference on our blog or see all related posts by searching - 2016 conference recap. 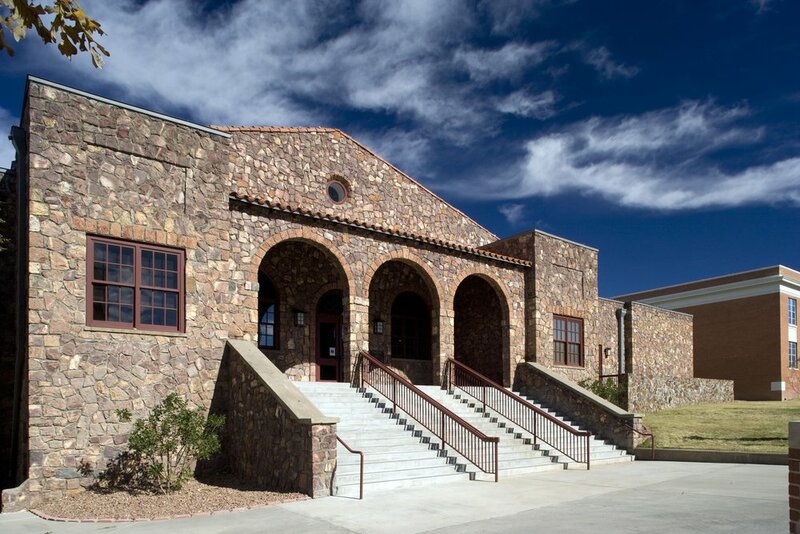 We are hoping you will be able to join us for the TASA conference in beautiful Alpine, TX, October 6-8th, 2016, as well as enjoying the Chinati Open House weekend in Marfa. The 12x12 square foot show will be at the Paisano Hotel in Marfa. The official conference hotel is the Hampton Inn in Alpine (432-837-7344). The Reservation Deadline for the conference rate is September 6 (TASA Conference Rate: $109.00 plus sales tax, single or double room, per night). And last but not least, the early registration deadline for the is September 5, after that date fees will increase. To pay by check, download the 2016 Conference Registration form (PDF) and mail with payment (check made out to TASA) and mail to the address listed at the bottom of the form. If your institutional membership check is “in the mail,” and you want to avoid the Institutional Representative Conference Late fee, be sure to EMAIL this form as an attachment after filling it out (see below) BEFORE or soon after SEPT. 5. For credit cards, please use the Eventbrite button below. Besides clicking on the Eventbrite button below to pay, please also download the above TASA 2016 Conference Registration Form, and on your computer, open it in Acrobat Reader (free download from https://get.adobe.com/reader/), fill it out, save and attach to an email back to Linda Fawcett at lfawcett@hsutx.edu. This is especially important if you will be attending the conference as your school’s Institutional Representative and want to avoid the late fee that might result if your school has renewed its Institutional membership but did not let me know you were coming as your school’s Institutional Representative by the pre-registration deadline. [Note that this year I will accept these forms for another 7 days past Sept. 5.] Simply say: “Inst Rep” as your conference fee status with Institutional Membership as “PD”. And be sure to also say if you will be attending the Saturday night Banquet and if you need a veggie meal (helps with plate count). Thanks! UPDATE: The 2016 TASA conference is now over. Please use the Eventbrite button below for membership fees and donations. Specific details and deadlines will be included in the upcoming conference materials. 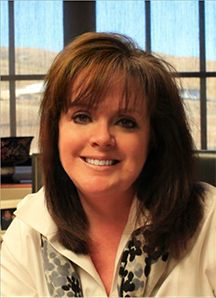 Liz Jackson, a Dallas native has held the helm as Executive Director at the Museum of the Bend in Alpine, Texas since 2010. 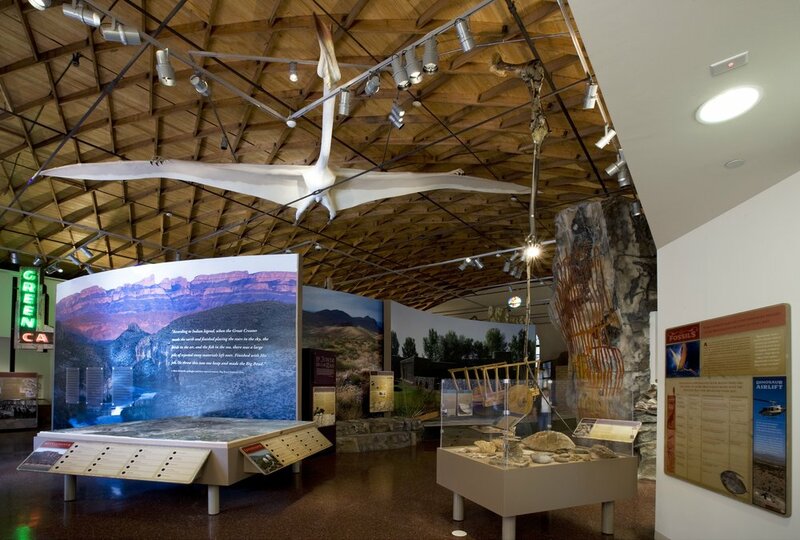 Prior to assuming her role as Director, Jackson joined the museum in 2001 and was instrumental in fundraising $4.5 million dollars for the Capital Campaign Museum Building Renovation Project which was completed in 2007 with newly installed permanent exhibitions telling the story of the unique and vast land of the Big Bend region. Over the span of her career at the museum, Jackson spearheaded the annual Trapping of Texas Exhibit and Event, the longest running western art and gear show of its kind. This year, the museum celebrates 31 years of Trappings. 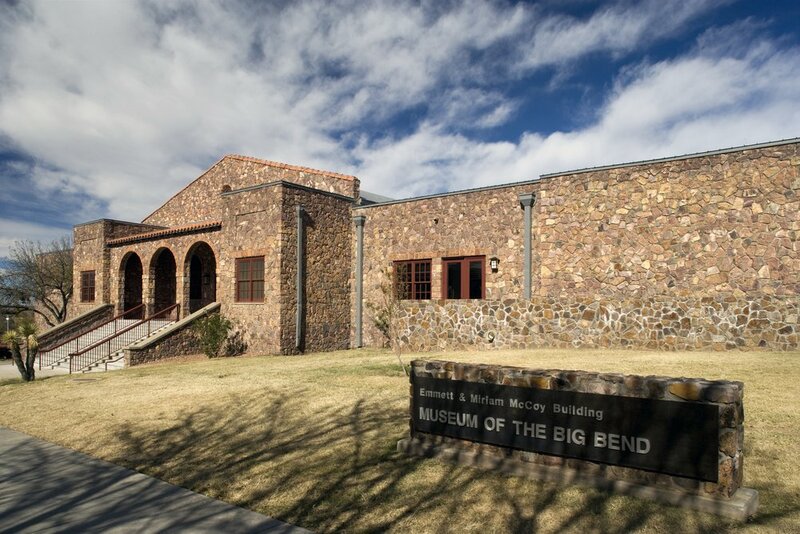 Under the direction of Ms. Jackson, the Museum of the Big Bend is a full service museum with educational opportunities for participants of all ages. Jackson is credited with bringing the rarely seen oil painting by Frederic Remington, “Charge of the Rough Riders” to the state of Texas for the very first time during the 2013 Exhibition of “Treasures from The Frederic Remington Art Museum.” Most recently, Ms. Jackson acquired the “Ken Ratner: Feeling of Humanity Collection” from New York and a second installation of the coveted “Yana & Marty Davis Map Collection: 5 Centuries of Texas Maps.” Ms. Jackson has been awarded the Bar-SR-Bar Award Employee of the Year Award and last year, was honored by the Girl Scouts of the Southwest as a 2014 Woman of Distinction. Jackson attended the University of Texas in Austin and holds a Master of Liberal Arts from Sul Ross State University. Liz is an active volunteer in the community, is married and has three children. “Constructing an Online Studio Art Class: Transitioning from a Conventionally Taught Drawing Course to an Online Class Using iPads"
In 2007, the iPhone was introduced, and world-renowned British artist David Hockney began using it to create artwork in 2009. When the iPad became available in 2010, Hockney began creating a body of work with this tool, and is currently producing exhibitions that include his large-scale 93” x 70” prints of virtual-drawn imagery. Prompted by Hockney’s engagement, Yarosz-Ash proposed scheduling a section of Drawing I to teach exclusively on the iPad during Spring Semesters, beginning in 2016. The first class was completed successfully in a traditional studio environment, subject matter and assignments - the only drawing surface and tool was an Apple iPad. This is a project that Professor Yarosz-Ash and her student research assistant, Emma Griffiths, have been engaged in since Spring semester 2015. Emma has been documenting the traditional and iPad Drawing I classes with digital stills, still life photos, subject matter selections, videos, demonstrations and student activities to use as online resources. All of the documentation functions on a Schoology online classroom site, which is also used as the assignment submission tool. Emma is currently curating, sorting and organizing the information in preparation for the iPad Drawing I Hybrid/Flipped class scheduled for Spring 2017. Ms. Griffiths has received two separate EURECA grants for her work on this three-phase project, for which the research and preparation will be completed in Spring 2017, and the course will transition to an online offering in Spring 2018. This presentation will focus on the initial iPad classroom experience and physical challenges, discussing course assignments, subject matter, apps, stylus, student response, and final student drawing examples. Ms. Griffiths will present the challenges and surprising results of printing the digital files to produce high quality drawings within a limited budget. 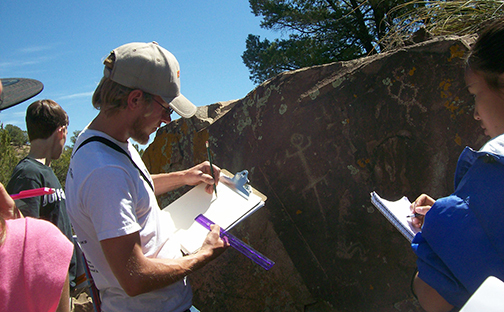 "Survey of Rock Art in Texas with a Focus on Opportunities for Students"
Bio: Andrew Tegarden received a BS in math From Texas A&M Corpus Christi and a MA in Art History From Sul Ross State University. He recently started working on a Ph.D. at the University of Arizona in art education. He has taught with various schools and programs in New Mexico and Texas, including Sul Ross State University teaching art history, art appreciation, and art education. Rock art is a major topic of research for him, both in art historically and in terms of its prospects for students. Mary Bones is the Curator of Temporary Exhibits & Adult Programming at the Museum of the Big Bend. 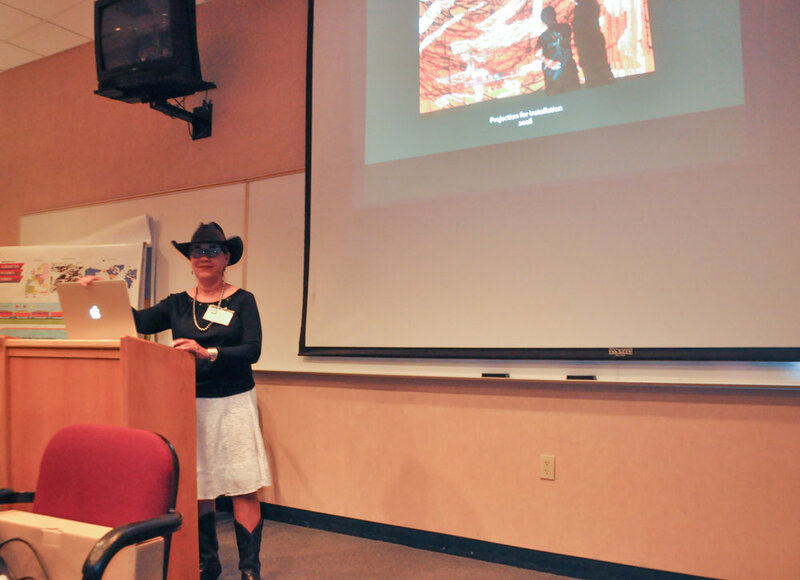 In this capacity she has been the lead curator of the Trappings of Texas exhibit since 2000 and through her hard work, this exhibit is nationally recognized as one of the finest western art and contemporary cowboy gear shows in the country. Along with Trappings of Texas, Bones curates all of the exhibits at the museum throughout the year such as the 2013 Treasures From The Frederic Remington Art Museum, the 2015 Tom Lea: A Retrospective, the 2016 TPS 25: The International Competition and the current exhibit A Feeling of Humanity Western Art From The Ken Ratner Collection. To compliment these exhibits, Bones launched a fall and spring Speaker Series, bringing scholars such as Michael Grauer, Adair Margo and Lonn Taylor to increase the public’s understanding and knowledge of the material presented in the museum’s temporary exhibits. In addition to curating exhibits, she is responsible for bringing learning opportunities to adults through Adult Programming. 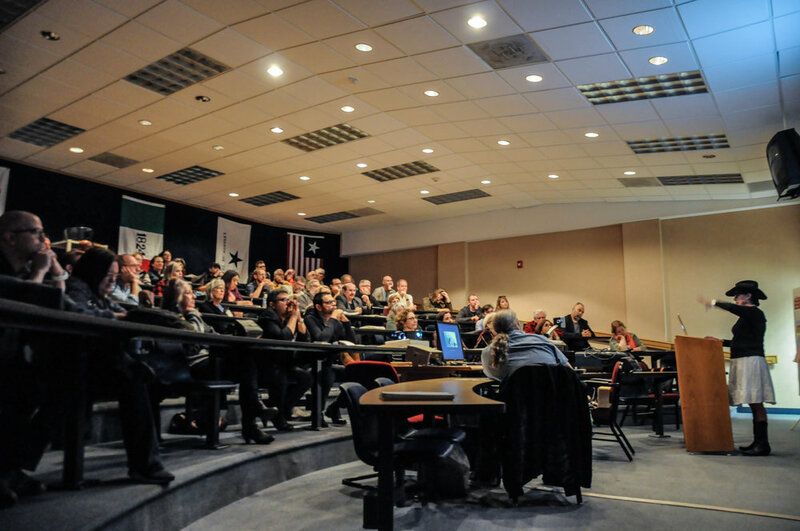 TINA FUENTES: "Transformations through Art and Science"
In 2014, I, Tina Fuentes, and atmospheric scientist, Dr. Eric Bruning received a National Science Foundation grant. A collaborative component of the grant was to allow opportunities for these two separate fields to further communicate with one another. In doing so, the grant has given me extended prospects in expanding my visual discourse within the arts. Given opportunity to gradually review and visually articulate the essence of storm formations within the clouds gives visions for two different (yet similar) worlds to work together. Dr. Bruning’s research is focused on the combustions occurring within cloud formations while Fuentes is looking to capture the sense of turbulence and ignitions that occur during the materialization of these storms. In doing so, one video component creates actions that metaphorically tie the essence of these waves and ripples through aggressive and expressive strokes of motion. Further visual statements of these conceptual movements are being captured through drawings and paintings. “Although many people may think of the arts and sciences as very separate fields, we are very closely linked in many directions. If nothing else, they are both highly creative fields of research,” -Fuentes. 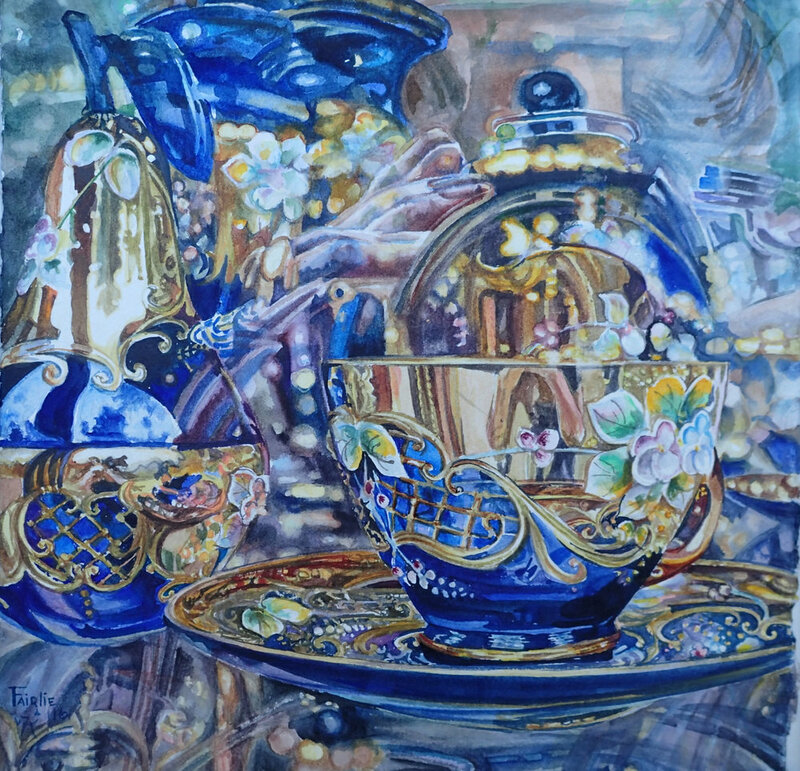 Ellie Meyer holds Texas K-12 art teacher certification and BFA, MA and MBA degrees. She taught business, art and art history courses at the University level as well as art to elementary and junior/senior high school students for 15+ years. Meyer has been active in fund-raising, development, and program planning in the non-profit sector serving on the Board of Directors of several and Executive Director of not-for-profit organizations in both New York City and Marfa, Texas where she currently lives. Prior to becoming Director of Akira Ikeda Gallery in NYC 1993-95 she worked for artist Donald Judd for eight years. She joined the Judd Foundation in September 2015 as Catalogue Raisonné Research Manager.